El callejero de Punta del Este utilizado por la F2 Codasur en 1985 contaba con 2500 metros de largo aproximadamente y se ubicaba en las costas de dicha ciudad, cerca de donde se ubica el trazado que ha utilizado el TC2000 hace un tiempo atrás. Cuenta con una zona veloz en la costanera y mixtos en la zona interna de la ciudad. The street of Punta del Este used by the F2 Codasur in 1985 had approximately 2,500 meters long and was located on the shores of the city, near where the path you have used some time ago TC2000 is located. It has a fast in the coastal zone and mixed in the inner city area . There are currently no setups for Punta del Este Callejero 1985. Add a Setup. La categoría de nivel continental se asemejaba en su reglamento a las categorías de F3, pero gran parte del auto se fabricaba en nuestro continente. 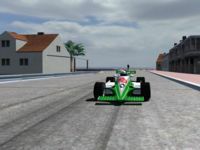 This is a great track, the AI racing line through the hairpin is way better than at mardel, just a few minor errors, some of the graphics are set too high so they only look right when run in full detail, I am running windows 7 with a high end graphics card & at full detail I get some graphic stutter & it will sometimes freeze for several seconds, this is better than windows 8 as that only seems to be able to run the most basic setup, I'm seriously thinking of returning to XP as I never had any problems with that. The FuelUse setting on both tracks are wrong they should be 39171.0 at mardel & 49671.0 at punta, this gives an accurate Fuel/Lap ratio in garage setup. The worst, mid & best adjust settings should be 0.8, 0.9 & 1.0, as 0.9 give the AI's an engine equivalent to the players starting engine, I am using the HotHatch 2.1 mod to set up lap times, as they have a standard engine, 1.0 gives the AI an engine equivalent to a stage 1 engine & 1.2 will give the AI an engine that is well above the stage 3+ engine available in the mod, quite why ISI chose these settings rather than the logical settings of 0.8, 1.0 & 1.2 to match the AI strength adjustment from 80% to 120% is a perplexing.